If you’d rather view your favourite team from a relaxed, enjoyable vantage point, bean bag chairs are the ideal solution. These portable and supportive seats cradle your body, allowing you to assume the most comfortable position for you and freeing your mind to enjoy the sights at hand. It’s no secret that the seating at sporting events can be uncomfortable, to say the very least. And if you’re at a venue which features ground seating, the situation can be even worse – sitting on a blanket or directly on the hard ground can cause backaches at best, and even lasting soreness in the muscles required to keep yourself in a suitable position to see the action. You can bring your own chairs, of course, but folding chairs are often nearly as uncomfortable as sitting on the grass. If your kids are involved in organised sports, you’re not alone. Nearly half of Australian children participate in soccer alone, and a quarter in cricket. For parents, this means a lot of trekking to sporting events and cheering from the sidelines as their littles ones engage in a thrilling battle for victory. Wouldn’t it be great if you could relax and enjoy the action whilst kicking back in a cloud of comfort? 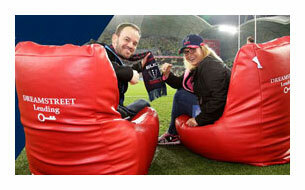 Bliss Bean Bags and sporting events make the perfect pairing. They’re portable, stylish, functional, durable, and most importantly, comfortable. Not only that but when you choose one of our many exciting colour combinations, you can customise your chair to be made in your favourite team’s colours. Show your team spirit in style while providing your body with gentle support through the long hours of the match. You can even personalise your bag with your team name or logo prominently embroidered right where you want it. When you’re out on the sidelines, your seating needs to be comfortable, of course, but it also needs to be tough, easy to clean, resistant to fading from the sun and the effects of the other elements, and look good all at the same time. Our chairs are constructed right here in Australia out of only the highest quality materials. Vinyl allows for easy cleaning, and the high-tensile-strength nylon thread means you won’t have to worry about the chair coming apart after just a few sports matches. At Bliss, we’ve put our materials through rigorous rub testing to make sure that our furniture is strong enough to provide you with years of service while remaining vibrant and functional. If you’re a sports fan, take a Bliss Bean Bag to your next rugby or cricket match and experience the luxurious feel of true comfort.